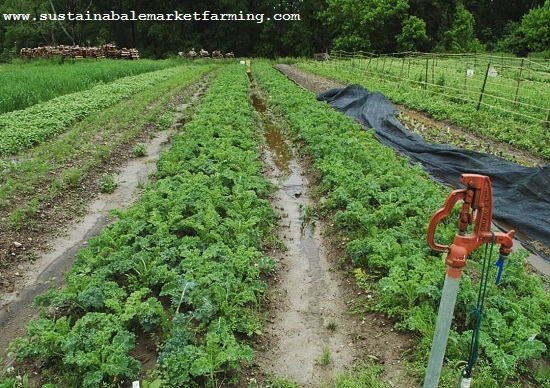 Author farmerpamPosted on March 27, 2019 Categories climate change, farm planning, Sustainable vegetable productionTags broadfork, caterpillar tunnel, cover crops, drainage, flame-weeding, flooded garden, hoophouse, no-till cover crop, wet spring2 Comments on What can you do if spring is too wet? 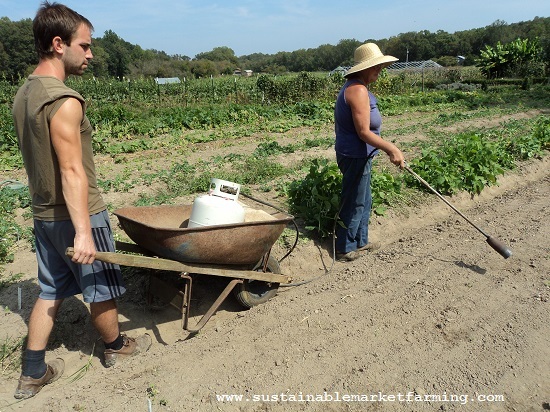 Harvesting carrots and beets, weeding, mulching. Now that we’ve got the garlic harvest behind us, as well as the June potato planting, we are turning our attention to weeding and mulching. 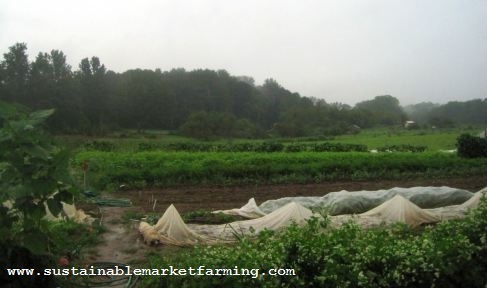 We have hoed our leeks, our recent corn plantings, and the newest beans, squash and cucumbers. We have sowed some more beans, and some more cabbage and broccoli for fall. 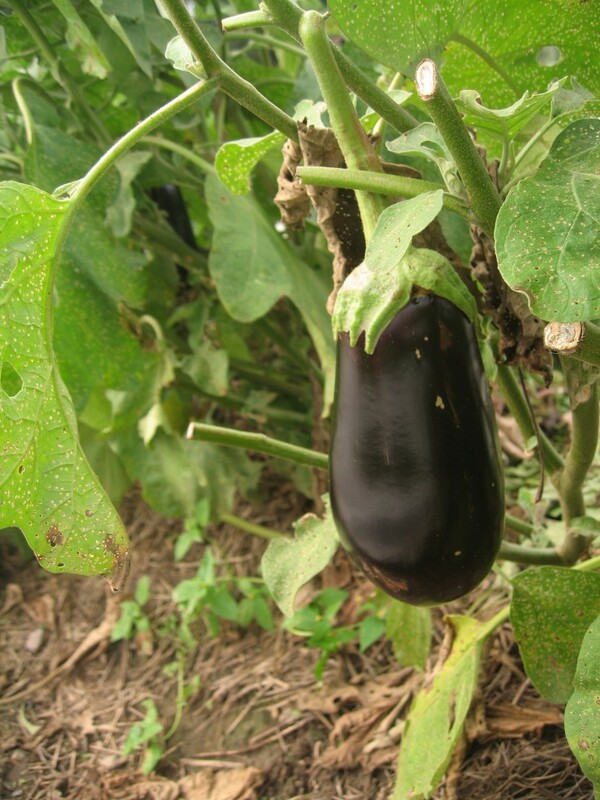 We weeded and mulched the eggplant, okra and slicing tomatoes.Eggplants are almost ready! Tomatoes are getting ripe! We walked through the watermelon patch and pulled out the weeds poking through the biodegradable plastic mulch, where it has started to crumble. Last week we did the same with the sweet potato patch. We’re getting ready to pull the weeds in the big Roma paste tomato patch, which also has biodegradable plastic mulch. 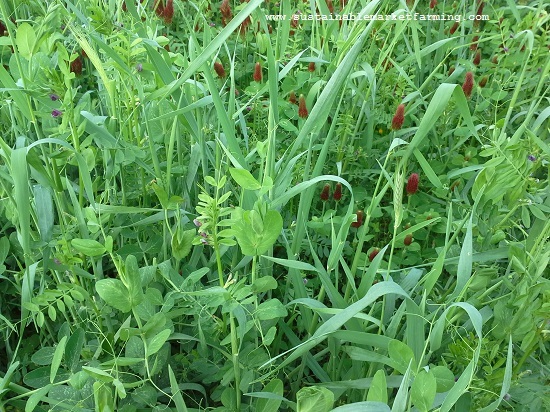 Usually most of the patch is in a mowed no-till cover crop, but last winter we had colder-than-usual weather, and poorer-than-usual stands of legumes in our cover crops. 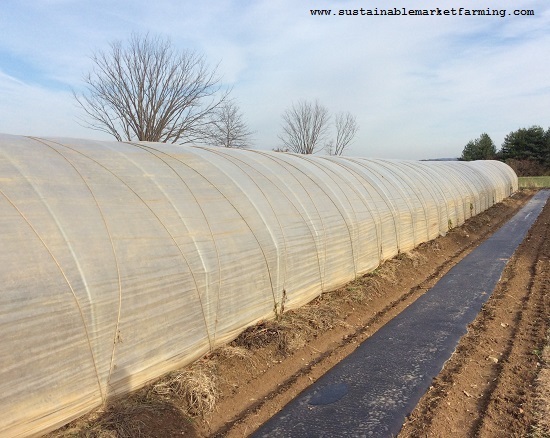 So we decided to add compost, disk the cover crop in and use bioplastic for the whole Roma plot. 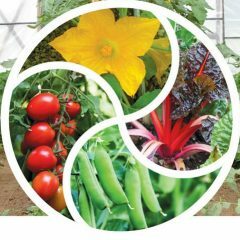 As I said in my previous posts about bioplastics, they are especially good for vining crops, and although tomatoes can be grown sprawled on the ground, we don’t do that. 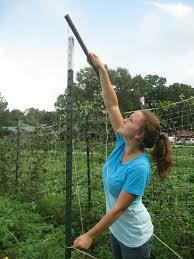 We stake ours and use Florida String Weaving. 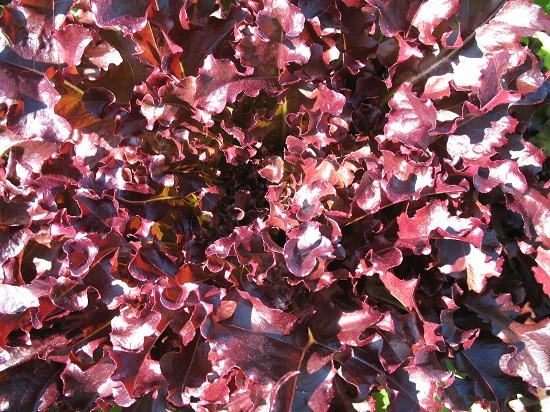 Another big task this week (and next) is clearing our spring sown carrots and beets, for storage in our walk-in cooler. Then we’ll steadily eat our way through them, as well as pickle some beets. Rumor has it that we still have some pickled beets from last year in the basement, although I haven’t checked that out. 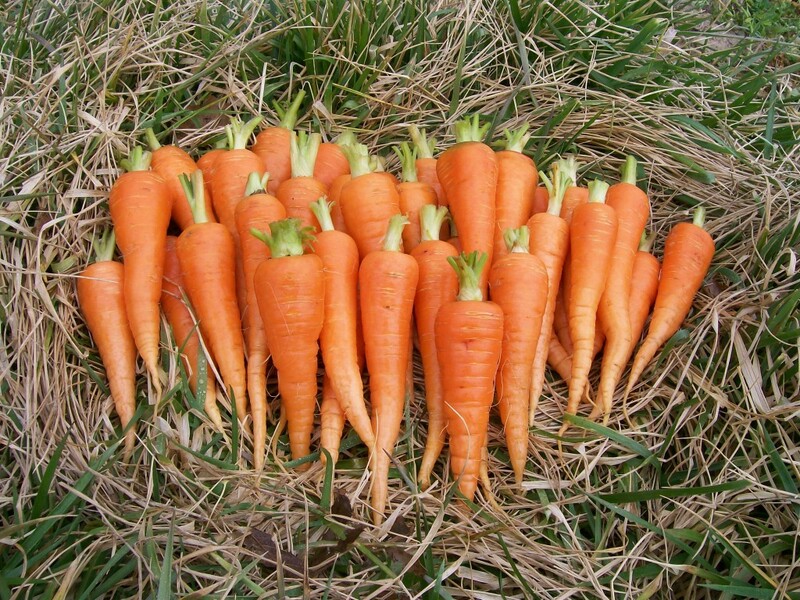 Carrots and beets get woody if left in the ground too long, especially in hot weather. So it’s better for us to harvest them all and store them under refrigeration. Actually we had to jump to it and clear one bed of carrots this morning, because the bed is needed next Monday for more sowings of fall brassica seedlings. We’ll add compost, till it, then rake. The crew cleared the five 90′ rows in just half an hour, to my amazement. We got 3.5 big bags. I don’t think anyone weighed them, but they were the standard size 50# carrot bags, but not so full. Maybe 150# total. They were sown 3/15. We have two beds that were sown earlier, but we don’t need those beds quite so urgently! 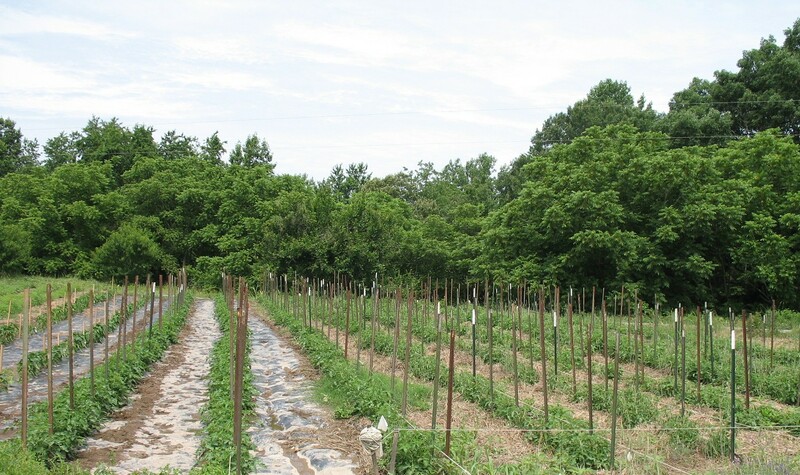 Author farmerpamPosted on July 1, 2014 Categories Sustainable vegetable production, This week in the gardenTags biodegradable plastic mulch, Florida strin weaving, Harvesting carrots and beets, June garden tasks, June potato planting, mulching, no-till cover crop, weeding2 Comments on Harvesting carrots and beets, weeding, mulching.